Dead PCs present several problems for a GM (not least of which is the rest of the PCs descending like jackals to loot their comrade’s still warm—probably yet-twitching— corpse). Much of the time we deal with PC death in a cavalier fashion. Typically, when a PC dies, his comrades act sad for a few nanoseconds and then loot the body. Quite often, they’ll then push on and leave their friend’s corpse where it lies! Dead PCs are a fact of (game) life, and a necessary component of gaming—a part we shouldn’t avoid. PC death can be an emotive subject, but that doesn’t mean we shouldn’t talk about it. (Fear not, I am not going to virtually hug you at this point). You can find plenty of articles online discussing PC death—if it should happen at all, when it should happen and suchlike. Given dice determine much of the action in our games, I find much of this kind of debate baffling. Death happens when death happens. Of course, no one wants to die in a pointless random encounter, but sometimes that’s your fate! Are there story or plot implications resulting from the PC’s demise? What level (and class) will the replacement PC be? If a crucial member of the party fell—say the cleric or thief—how can the party keep a good mix of classes and capabilities if the player wants to try something new? But for all that, though, the GM is left with one pressing problem—how to insert the replacement PC into the adventure. If the PCs are in the depths of a dungeon—and will be for several sessions—having a new PC magically appear might not be the ideal solution. Balanced against this: no one wants to watch his friends play for session after session while he waits for a “realistic” opportunity to join the group. Usually, it’s best if the party retreat and regroup after one of their friends has just died. At the least, this might be a good time to bury the body, grieve and put their friend’s affairs in order. Sometimes, however, there are story-based reasons to push on—the evil wizard will soon complete his ritual, the dungeon is flooding and so on. In those situations, what’s a GM to do? Luckily, the GM probably won’t have to act immediately as the player will be wailing, gnashing his teeth, crushing the dice that betrayed him into dust and so on. He’ll also need to make a new character, which might take quite some time. 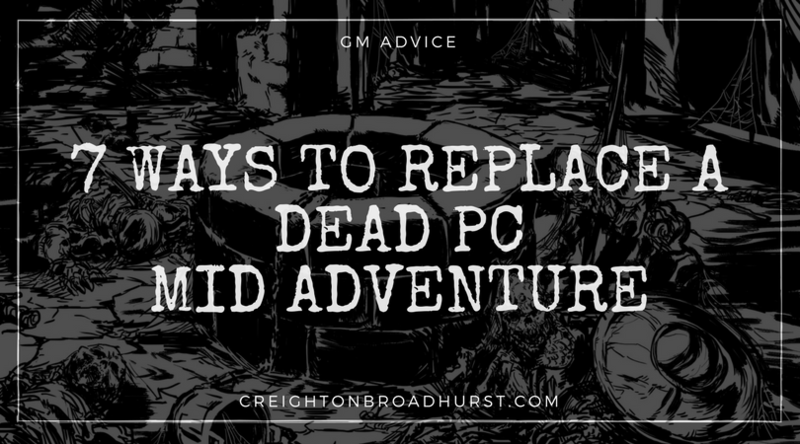 Given PC death—in most games—is an ever-present threat a clever, cunning and diligent GM should have pondered how to insert new PCs into the adventure. (As you might have guessed by now, I’m a big fan of preparation). The new PC is already in the dungeon and is a prisoner. The GM should work with the player to work up a story describing the PC’s capture. In an actual dungeon, prison cell or oubliette. In a torture chamber “enjoying” its master’s attention. Dragged—under light guard, of course—from one place to another. However the PC is encountered, ensure the PC’s equipment is nearby, so he isn’t disadvantaged when he joins the party. In case the party find the gear first, ensure it is obvious it belongs to a fellow adventurer; that makes it easier for the new PC to claim it later. In a similar vein to #1 above, the PC is a captive, but only recently captured—and is being dragged into the dungeon/to her cell when the party encounters her captors. The main advantage of this scenario is that new PC’s equipment is likely being carried by said captors making it blindingly obvious to whom it belongs. The new PC is a messenger. He could be carrying a message for the party—particularly if they are working for a patron—or he could have a missive for someone else thought to be in the area. He could even bring them a job offer, which could handily lead to the party’s next adventure. The new PC is the sole survivor of another adventuring band exploring the dungeon. As luck would have it, she stumbles into the party’s path. This method is perhaps the most overused of all those discussed here and works best if the GM has foreshadowed the other group (which doesn’t take much effort). The PCs could have heard rumours of the other adventurers while in town preparing their expedition, for example. Foreshadowing the other party roots them in the campaign world and makes the new PC’s arrival less jarring. The new PC has been spying on the dungeon’s denizens for a rival (a rival—preferably—acceptable to the PCs; a local lord or good-aligned church are excellent choices). The party’s arrival forces the new PC to change his plans—probably to confess to being a spy, so the party doesn’t slaughter him—and to cast off his disguise. His cover “blown” he has no option but to join the party. The new PC was once an enthusiastic member of the group controlling the dungeon (or perhaps was a mercenary in their employ). However, recently she has seen the error of her ways and has been plotting to flee. The party’s arrival provides the perfect opportunity to do just that. Turning on her fellows—or employers—she helps slay them, which is a powerful way of proving her worth to the party. In this scenario, the group comes across a trapped adventurer. She could be trapped in a pit (unable to climb out), in a secret room (for which she cannot find the exit) or by a monster (which she cannot win passed on her own). The party saves her and she joins the party with a ready-made reason to work with them (at least until the party leaves the dungeon). Remember, the play’s the thing. A wise GM makes the best of the situation and uses a PC death to further the campaign. The manner of a new PC’s arrival into the group can lead to memorable role-playing situations. It can also be used to provide the party with information or equipment vital to their quest. It can also be used to present plot hooks for future adventures. Using one of the options above makes the PC’s arrival more memorable than that of a random, wandering adventurer who is instantly trusted by the party for no real reason. In such a manner, the original PC’s death becomes something that helps the campaign grow and evolve and not a wholly negative event. And—a final thought—the solutions above can work for more than one PC at a time; this is particularly handy if you need to replace more than one PC at the same time. Thank you to Tom Ganz who recommended this article subject. I wish I’d thought of it myself. Did I miss some original way of inserting a new PC into the group mid-dungeon? Let me know, in the comments below. Hoa, I’ve done #3 & #4 and now we’re preparing for the follow-on adventure, in which we had another PC death. The good thing is that on this turning point between adventures there is a Rivendell-like gathering, in which we can introduce new PCs to the party, as ambassadors of certain factions or even emissaries who will help the PCs. This will be the case for the two new PCs in the party (one of a current player whom the hero died and one of a new player). The other thing is that typically the new PCs follow the others level. I used to introduce them in level 1 (should the party be no higher than 4th level) but afterwards I did the “same level” approach, as the encounters where lethal for lvl 1 PCs. Plus, the party is 4 to 5 people strong, so having 3 lvl5 PCs and one lvl1 creates great imbalance. Aren’t all the members of the party crucial? Great list as always. I usually try to incorporate a story to a new PC. And, usually have the replacement start at their level. The problem I found with that, is, the players tend to “game the game” and optimize the new PC to exactly fit the story. For example, playing Iron Gods, the new warpriest, from Idenveigh, is 80 years old, while Idenveigh itself is 60. Idenveigh is anti technology, and so is the warpriest. So far everything is on par. The warpriest chooses languages, and one of them just happens to be Androffan. An alien language found on technology. Or, a new goblin pc who happens to be a tech slinger. My way of attempting to sway these “story adaptive” new high level PCs, is to start them at level 1, while the rest of the party is level 12. By the time the others are level 13, the new guy would be 10. Didn’t see how you deal with level. Would you start them on par with the current PCs? Or would you start them at level 1? Since my favorite Game is Star Frontiers, I’ll add released from a hibernation berth but in reality its a variation on the Trapped theme. If the PC’s are on a quest, you could have a new PC arrive after getting a vision from their deity – this would work especially with religious type characters such as paladins. Is “promote a henchman” no longer a thing? It absolutely should be! In my experience, though, henchmen are not a common sight in 3.0+ era games. The party returns a family heirloom (perhaps a sword or a broach) and break the news of the fallen PC’s demise to the family. A sibling insists that he is to return and vows to exact vengeance on those responsible, and to restore honor to the family name. Another option might be for the PC’s to discover a statue near the lair or former lair of a monster with the capability of turning creatures to stone. There should be some evidence that the statue was formerly an adventurer. Of course, the party must either have the capability of casting “stone to flesh” or discover a magic item in the area that allows them to do so. Another method that is common in myth is when a member of the adventuring party bests, or is bested by, an NPC in non-lethal combat or some other contest. The impressed NPC then offers to join the party on their quest or mission. An example that quickly comes to mind would be when Little John joins Robin Hood’s band of Merry Men. This would require additional thought regarding how to set up the encounter, but could result in some memorable role playing. For example, this could be conducted like a wandering monster encounter as the PC’s return to their home base. 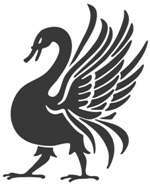 Even if the party member did not best the NPC, he or she could be impressed enough to join the party. The set up of the encounter could be that the NPC is blocking the path of the party, or the NPC has information or an item that the party needs. One decision that would have to be made is whether to have the player that lost their party member role play the NPC during the contest or to wait until the end of then encounter before they take control of their new character. A bit off topic but the comment that “no one wants to die in a pointless random encounter.” If one looks at the historical sources, it seems that the English warlord that provided the nucleus of the King Arthur legends may have done exactly that. From what I remember of the sources I read back in medieval military history class, Arthur’s coalition of Romanized Brits had beaten back a large Saxon army and were enjoying a 40 year period of no invasions. Apparently he was trying to turn a temporary military alliance into an actual kingdom and opps a random arrow in a minor battle in the northern areas (south of Hadrian’s Wall) put an end to his plans. I used that idea for my campaign world – the general who had united everyone to win a great victory against an evil humanoid horde died by a unlucky arrow during the clean up battles. After all what self respecting defeated humanoid horde is simply destroyed when their demonic leader is slain? They break into smaller tribal bands and continue to be a nuisance for a while. (evil smile). I’ve done things like have a character bound to a magic item. This is really helpful if the player is also one who can’t always make it to a session. This lets the players bring their companion into play as needed. If the group is one that’s willing to suspend a bit more disbelief and only use the item when the player is present this method works really well. I’ve had PCs tied to figurines so that when the party needed their companion they would just summon them. I have also had the party caster accidentally summon the PC. That’s always fun. I have had a PC that was originally polymorphed into the monster. Destroying the monster released the PC. I even had the party summoned, just like monsters can be, to a more powerful being and they were compelled to complete a quest via geas. The new PC was also summoned at the same time and was forced to join forces with them.